Left to right: Ronnie Sloan, President, The Outer Banks Hospital; Krista Sipe, Manager of Regional Operations; Collins; Lynne Miles, Administrator of Regional Operations; Teresa Bradshaw, Staff Nurse, Outer Banks Internal Medicine; Luisa Vasquez, Medical Assistant, Outer Banks Internal Medicine; Jennifer Allen, Manager of Regional Operations; Dr. Vern Metcalf, Outer Banks Internal Medicine. 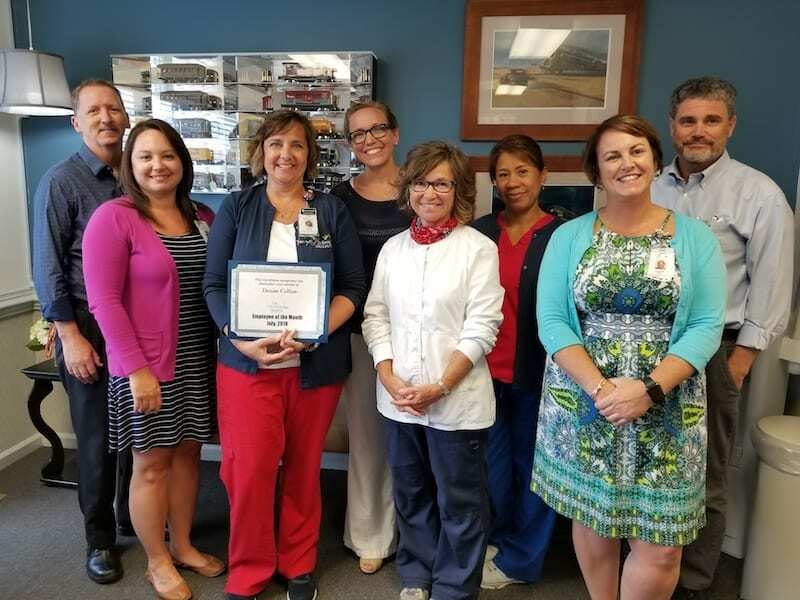 Denise Collins, Service Line Coordinator at Outer Banks Internal Medicine, is The Outer Banks Hospital’s July, 2018 Employee of the Month. Collins joined TOBH in March of 2007 as a member of the Admissions team. Collins, a long-term and loyal team member, rises to the daily challenges of the unexpected and creates a seamless workflow for the busy practice. As the face of the front office, she balances the needs of patients, physical logistics of the office, and dynamics of her team members with a warm and welcoming smile. Collins goes the extra mile to make Internal Medicine a better place by treating patients as family and remembering birthdays or special events with a baked good or card. She knows and treasures their stories. This year, Collins has taken on even more responsibilities, with various reporting duties and being a resource for other medical groups and practices. She is an excellent example of our values in action.